I wrote this piece for the Dallas Morning News. It was published on May 19, 2002. Jimmy Carter’s landmark journey to the land of Fidel Castro last week opened a new, promising and uncertain chapter in U.S.-Cuba relations, just as Cuba marks the centennial of its independence, observed on Monday. The former president shook up and inspired Cubans while taking jabs at the Bush administration’s hard-line policy toward the socialist government. The showdown over Cuba appears to be intensifying, and no one is sure how it will shake out. “As with most things, it won’t be a straight line from here to the finish. There will be fits and starts. 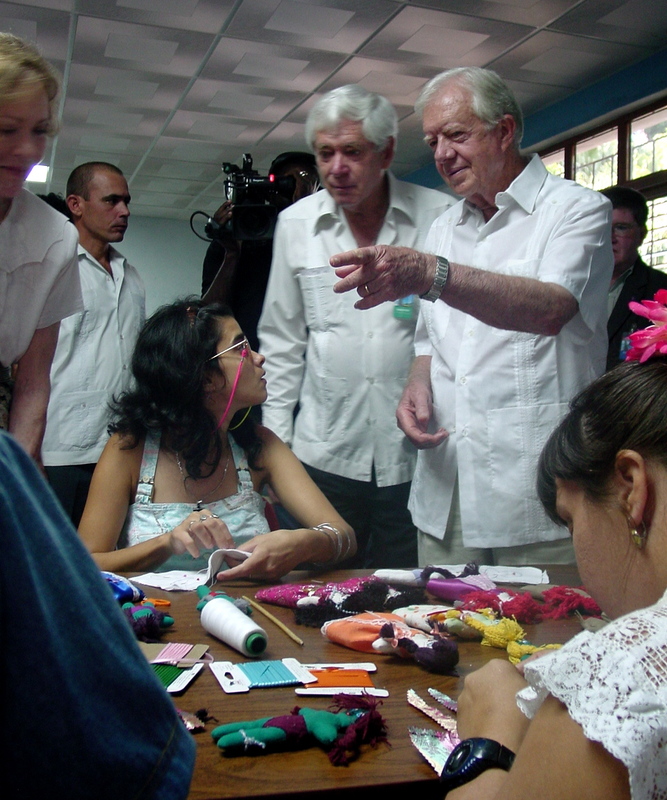 But Jimmy Carter’s visit showed that we can have dialogue with Cuba. This is the beginning of the end of total hostility,” said Sally Grooms Cowal, a former career diplomat and now president of the Cuba Policy Foundation in Washington, D.C. The anti-Castro camp, which includes President Bush, is not ready for that. “Fidel Castro is a dictator, and he is repressive, and he ought to have free elections,” Mr. Bush told reporters in the Oval Office last week. Last year, the president stepped up enforcement of the U.S. trade embargo, and on Monday he plans to announce further get-tough measures. Among them: greater support for Cuban dissidents; new efforts to broadcast radio and television programs to the island; and greater scrutiny of Cuba as a so-called rogue nation and a possible national security threat. The president plans to celebrate the Cuban centennial in Miami with Mr. Castro’s sworn enemies. It will be both a celebration and a call for greater freedom on the island. Cubans, on the other hand, will mark May 20, 1902, with bitterness. The island became a republic 100 years ago, but the United States had pervasive influence until Jan. 1, 1959, when Mr. Castro’s revolutionaries gained control. That is the date many Cubans see as their true independence day. That revolution brought totalitarianism and deprivation. Most of Cuba’s 11 million residents are mired in poverty. Cuba remains a nation divided, with more than 3 million of its people in exile, many of them in Miami fighting against the Castro government. The island nation has free, and advanced, health care, one of the highest literacy rates in the world (96 percent) and a revitalized tourism industry that is bringing new development to the island. But few ordinary citizens are benefiting from the economy, which has yet to deliver on the ideals of egalitarianism. And the country has an implacable foe 90 miles north: the United States. Demand for normal relations grows in Washington and in Havana, especially in light of the visit by Mr. Carter, the first current or former president to set foot on the island since 1928. 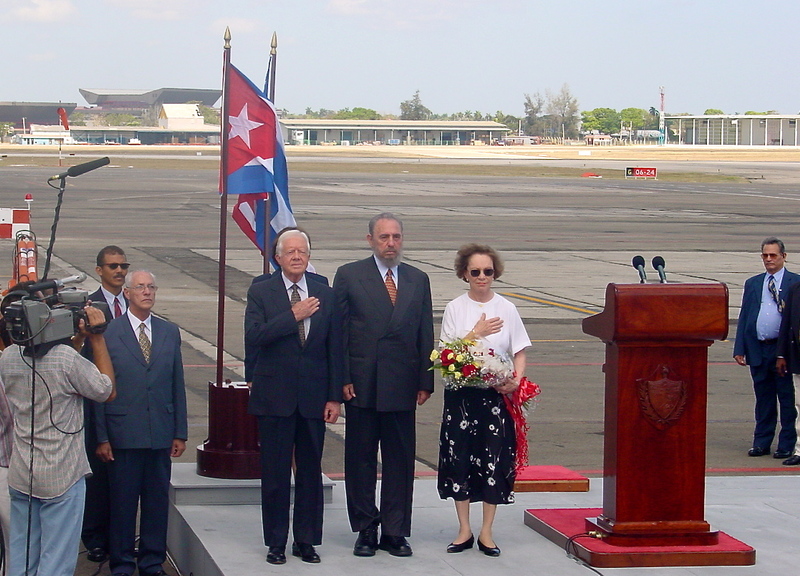 In a nationally televised, uncensored speech to the Cuban people, Mr. Carter urged that Cuba join the other nations of the Americas and bring about democratic change. And he called for the United States to take the first step toward ending decades of hostility by lifting the ban on travel and trade with Cuba. 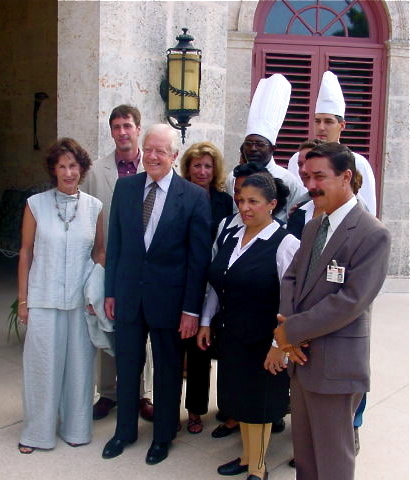 Cuban officials respectfully listened to Mr. Carter, but said they are not ready to change. And that worries some people. If Cubans don’t lay the groundwork for change now, what happens when the 75-year-old Mr. Castro fades from the scene? Will the government be ready? Will it be able to satisfy pent-up demands for a better life and greater freedom? Whatever happens, Castro loyalists say they are proud. At least, they say, Cuba isn’t the 51st state or a U.S. possession. Cuba occupies a different place on the U.S. radar than the other nations of the hemisphere and has for more than a century. “We’ve had almost an obsession for over 200 years that the U.S. should control Cuba,” said Wayne Smith, the top American diplomat in Havana during the Carter administration. U.S. companies invested heavily in Cuba, then under Spanish control. America intervened in the Cuban war of independence, battling the Spanish after the sinking of the USS Maine in Havana’s harbor in 1898. In defeat, Spain relinquished the island. The United States raised the American flag and installed a military government. Military occupation ended on May 20, 1902, and Cuba became a republic. But it was anything but free. It also required Cuba to keep a low public debt, to avoid signing any treaties that interfered with its obligations to the United States and to provide land for a naval base, known today as Guantánamo. Over the years, the island became a playground for Cuban elites and Americans. Coca-Cola, Ford, General Electric, Bristol-Myers and other companies set up shop. Steamships and seaplanes shuttled tourists from Miami to Havana. Hotels and racetracks sprang up. Mob boss Meyer Lansky ran bustling gambling operations and a school for casino employees. The poor saw little of the action. Wages were miserable. Police were brutal, sometimes murderous. And by the 1950s, a young lawyer named Fidel Castro was urging rebellion. The peasant revolt grew, dictator Fulgencio Batista fled, and Mr. Castro took power on New Year’s Day 1959. The Americans weren’t happy, especially when Mr. Castro veered toward socialism, cozied up to the Soviets and tried to export leftist revolution. Cuba nationalized American assets, and Washington imposed the trade embargo . U.S.-backed mercenaries invaded in 1961, but were defeated. Later the Americans tried snuffing out Mr. Castro with exploding cigars. That failed, too. In May 1963, declassified documents show, the Americans suggested creating “an imaginary Cuban leader” to oppose Mr. Castro. An anticommunist resistance figure who is “friendly to Cuban people … willing to fight against the regime. Little, but tough. A native David in opposition to Castro, the Cuban Goliath.” The plan fizzled. But the struggle continues in earnest. U.S. taxpayers today foot the bill for an array of anti-Castro programs, including Radio and TV Martí, aimed at sending American-style programs, ideas and doses of capitalism into Cuba. 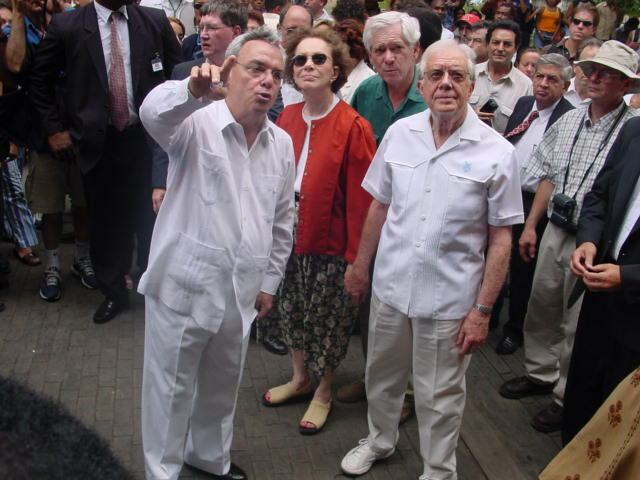 “When you consider that for many years, the CIA station in Miami was the largest CIA establishment outside Washington, and when you know that we have spent half a billion dollars over the past few years just on Radio and TV Martí, the total bill for our efforts to get rid of Castro must run to hundreds of billions of dollars,” said Mr. Smith, the former Carter administration official. No matter. From 1996 to 2000, the U.S. Agency for International Development handed out $8.3 million to 15 nongovernmental anti-Castro groups in the United States, an independent audit showed. * The nonprofit Freedom House spent about $275,000, most of it from AID, to promote democracy in Cuba last year. Inside Cuba, the latest and boldest dissident effort, the Varela Project, has collected more than 11,000 petition signatures to try to force a referendum asking for general elections and greater civil and political liberties. Cuban officials, who say the United States cooked up and funded the Varela Project, have embarked on a quest of their own: saving socialism. Toward that end, they say they are determined to bring in more hard currency, lure foreign investment, improve efficiency, cut petty corruption and boost wages – all while maintaining free medical care and schooling. And they say they’ve come a long way. The economy went into a downward spiral after the collapse of the Soviet Union in 1989 and the accompanying loss of $5.8 billion a year in subsidies. The Cubans suddenly had to go it alone. They had to build a self-sufficient economy. And against all odds, defying experts who predicted collapse, they yanked themselves from the abyss. The economy began to grow with tourism as the new mainstay, outpacing the sugar industry. Now, glitzy hotels rise in Havana’s Miramar district. Workers renovate historic Old Havana. And some 2 million tourists flock to the island every year. Cuban officials are proud and optimistic about the country’s future. Their American counterparts are not. The Cuban government is still cash poor, a State Department official said. Cuban officials blame the American trade ban for strangling the island’s economy. A big consolation, he said, is that the country is free of foreign influence. Meanwhile, the clamor grows for the United States to change its policy toward Cuba. “The U.S. embargo is anachronistic, inhumane, ineffective and hypocritical. At some point, U.S. lawmakers will have to realize that this failed policy needs to end up in the dustbin of history,” said Jason Marks, a spokesman for Global Exchange, which sponsors educational trips to Cuba. Twenty Democrats and 20 Republicans in the House have formed a working group with the goal of easing the U.S. restrictions on Cuba. But President Bush’s strong opposition may make their task more difficult. U.S. Rep. Jeff Flake, an Arizona Republican who co-chairs the working group, is optimistic. Be assured, Cubans say, that won’t happen.